Céleste Boursier-Mougenot who was already present in Venice, had to be presented in Lyon this year. And it is with an art piece called "Aura" that he invested the ground floor of La Sucrière. Located centrally in the form of a battery, it is a continuation of "Averses" (2014), which received showers when cosmic rays fell within its scope. With "Aura", it is the visitors that trigger random rains of cherry stones via all the magnetic fields that surround us, since we are all carrying cell phones. From a strictly sonic perspective, the solos that follow without ever being the same are comparable to the more extreme drum solos. A quintessential sound artist, Céleste Boursier-Mougenot likes techniques conducive to non-predictability, to the point of not hiding them as in when they help him to preserve the aura - as Walter Benjamin defined it - works that he cannot predict accurately. The "Little anthology of cheating" by Julien Prévieux has been specifically designed for this Biennale. All the objects that are presented on the bleachers evoking the presence of spectators that we sometimes hear booing, illustrate the tumultuous relationships that international sports federations have with technological innovation. 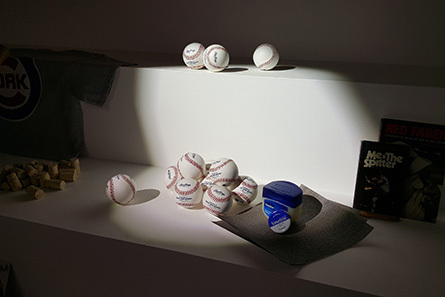 The artist adopts at once the posture of the investigator dealing with the risks of sport as well as the curator having gathered together the objects (a bicycle, a baseball bat, golf balls, etc.) of historical scandals. The white light that successively illuminates these accessories literally illustrates the spotlighting that sports journalists have brought to bear on them. 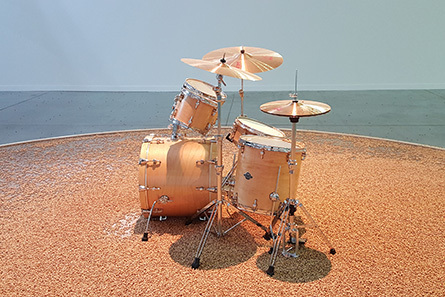 More generally, this installation addresses the ambiguity of our relationship to innovations, whatsoever they may be, in the fields of education, industry or the economy, because they precede the rules that encourage us to reconsider. Or when, beyond ethics, it is those circumventing these innovations who are also involved in specifying their parameters. On January 20, 2012, on the advice of the FBI, the New Zealand police went to the apartment of Kim Schmitz, aka Kim Dotcom. They seized his belongings as he was being accused of intellectual property infringement. This is not surprising when you consider that he is also the founder of the online file-sharing platform Megaupload, closed January 19, 2012 by the US court. The installation "The personal effects of Kim Dotcom" by the investigative artist Simon Denny, gathers together some of the vehicles among other ‘art’ objects that belonged to the businessman with the aura of a hacker. We can no longer, therefore, touch the body of this car having acquired the status of a work of art. Though it is still in all regards a major innovation, the Internet prompts states under pressure from lobbies of the international cultural industry to reconsider the contours of laws designed to protect intellectual works in preventing us access "in one click". Of the many forms of Jasmine, which already scented antiquity, there are over two hundred varieties among which, night musk, so named because it releases its scent during our sleep. Hicham Berrada has placed these in terrariums arranged on the floor of the Sucrière. But he had to reverse their circadian cycles by making the olfactory system "Mesk-ellil" a light installation so that the public of the Biennale could revel in it during the day. The protocol is scientific. 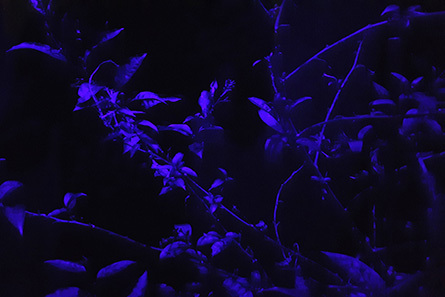 By night, a horticultural lighting simulating sunlight illuminates the plants. By day they are bathed in a bluish darkness. It is therefore by acting on their environment, of which they are an integral part, that the artist activates the work. Its action on plants, albeit indirect, is all the more radical. Which does not interfere in any way with the poetry that emerges. The technical prowess of the artist, the antithesis of the technological feats of the cut flower industry, refers us to the architects of the hanging gardens of Babylon. 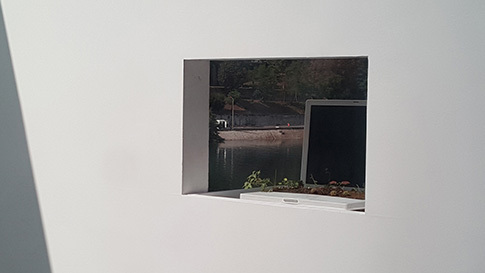 Michel Blazy, meanwhile, suspended miniature gardens ("Pull over time") on the balconies of the Sucrière where plants emerge from the electronic scrap of our contemporary landfills. Victims of planned obsolescence programmed long ago by the heads of marketing departments of high-tech enterprises of image and sound, laptops, video players, cameras, headphones and inkjet printers are reinvested by verdant nature as ship wrecks naturally are on the seabed. But the message here is ambiguous. For if one is pleased with the observation of nature empowered, one cannot at the same time help thinking of the world that would carry on. The development of living organisms, in this case, would be the consequence of a programmed end as well - a disaster whose finality we would advance towards tirelessly as in the worst-case scenarios of futuristic literature or cinema. In the mid-1980s, President François Mitterrand used the term "wired" on television to show how connected he was. Today, being connected would be to do without any connection, using the cloud. But it is the cables of all shapes and colours interwoven ("Mid-Sentence") that the artist Nina Canell presents us in this biennial entitled "Modern Life". Without actually knowing what it is they have transmitted, whether electrical or data. But no matter when Jeremy Rifkin tells us that the third industrial revolution will take place at the crossroads of renewable energy and Internet technology. Still, we have never been so dependent on cables, on the ocean floor as underground, connecting the data centres of our personal information. The cables, whose cuts we observe and to which the artist has devoted a book that has the appearance of anatomical plates, in reality, are essential. We depend on them as our bodies depend on our arteries and veins. 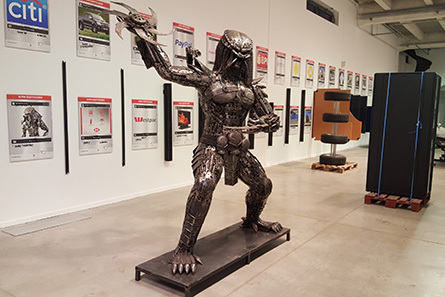 A few steps from the Sucrière, there is the Espace Verney Carron showcasing the works of the exhibition "Oxi More On", which was curated by Alexis Jakubowicz and Philippe Riss. 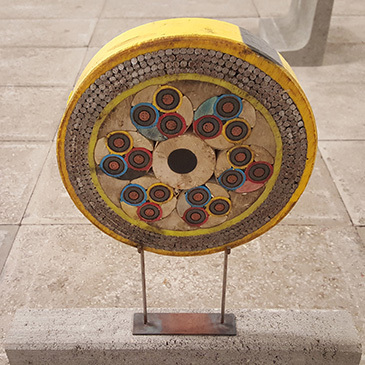 There we find intertwined cable assemblies, but hollow this time, because the artists Grégory Chatonsky and Dominique Sirois have made plaster casts as are made in archaeology. 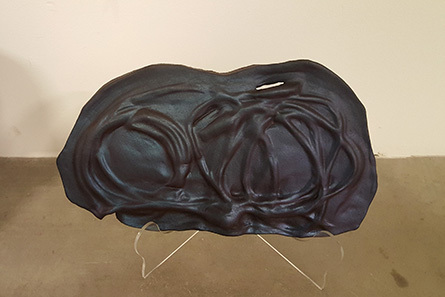 Entitled "Laocoon II", the work refers to the mythological character who in confronting snakes mistakenly became one with them. But is it not this intertwining that made the success of the ancient sculpture of the Vatican collection? It is recognized that the tips of the cables are the fragments of "Laocoon II" because they are an integral part of the equipment that we are inter-facing with daily. A question emerges: how might our dependence on technologies, which are those of our "modern life", be interpreted by the archaeologists of the future? Written by Dominique Moulon for MediaArtDesign.net and translated by Geoffrey Finch, October 2015.